In the days following reports of Fidel Castro’s July, 2006 intestinal surgery, news organizations, US governmental organs, online media throughout the Cuban diaspora, and the streets in Little Havana and elsewhere issued declarations of historical change. (2) Castro, some proclaimed, was dead, and with his body’s failure the Revolution was at an end. Political power, a man’s body, and the construction of history coalesced in these outspoken reactions. For these public bodies, an individual death signaled a historical turning point. Soon after the voices and print hit the street, the Cuban government, in a move to quell the aspirations of Washington and Miami, released a photograph they claimed postdated Castro’s surgery. 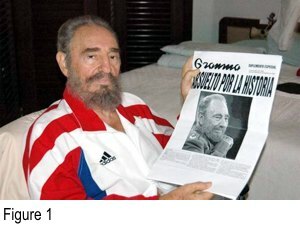 The photograph pictured a seated Fidel Castro dressed in an Adidas warm-up suit. In his hand was the official Cuban newspaper Granma, with a photograph of an aged Fidel in military dress beneath the headline: “Absuelto por la historia.” Fidel, the photograph instructed its viewers, was alive. As I will explain in detail below, this photograph stages a powerfully choreographed encounter between different media technologies (print, photography, radio, digital), the human body, histories of political corporeality, private and public spheres, and the changing role of the “author function” in a digital world. In focusing on the overdetermined space produced by this image, I want to slightly alter the terms of Jean-François Lyotard’s essay, “Can thought go on without a body?” and ask instead, “Can power go on without a body?”(3) In other words, what kind of knowledge does this photograph produce? What type of belief does it encourage? What kind of new publics and new politics can we associate with the digital? How does new media enable the people to create a public body? Does a political leader still require a body to exert power over a people? A viewer with only the most minimal knowledge of twentieth century popular iconography can identify Fidel Castro. If not as commercially circulated as the celebrated image of his fallen comrade Che Guevara, Castro’s uniformed body has long ago acceded to an honored place in the global imaginary; one easily recognizes his likeness at most costume stores. He has, indeed, “grasped himself as a medium” (Lyotard, 290), and crafted for himself a public image some half-century and more in the making. Correlated with the advent of digitization, then, the body undergoes a certain empowerment, since it deploys its own constitutive singularity (affection and memory) not to filter a universe of preconstituted images, but actually to enframe something (digital information) that is originally formless. Moreover, this ‘originary’ act of enframing information must be seen as the source of all technical frames (even if these appear to be primary), to the extent that these are designed to make information perceivable by the body, that is, to transform it into the form of the image (Hansen, 11; emphasis in original). Different from Hansen’s phenomenological approach to the digital image, I want to reinsert the body as one of many frames and mediums that include the printed text, the radio voice, the digital photo, and the newspaper photograph. Including the body within the representation network, we can begin to see how our photograph makes an unexpected use of the “world as text” ideology Hansen opposes. Inverting Hansen’s terms, we will see how the printed text of the headline paradoxically assumes a framing function, wherein the movement between the digital and the analog creates a digital / analog hybrid with a sophisticated political purpose. Castro’s iconicity—his body as medium—derives from a programmatic insistence on the continuous representation of his body most explicitly laid out in his early textual defense, La historia me absolverá (1953), presented before the Cuban tribunal under Fulgencio Batista’s regime. Perhaps Fidel’s most widely circulated text, this legal defense, whose title is obviously indexed by the newspaper headline in Fidel’s hands, helps structure the semiotic and historical interplay at work in our photograph. Again, the printed text frames the meaning of the photograph in which it rests. In this historic text Castro obsessively returns to the figure of the military uniform. As a sign with multiple and opposing referents (both Batista’s regime and Castro’s revolutionaries wore the same color fatigues), the military uniform poses strategic problems for revolution. In an insight that resonates in our contemporary moment, Castro implicitly recognizes the uniform’s legal force; the Geneva conventions legitimize and protect his soldiers as long as they remain clothed in fatigues: the uniform alone distinguishes them from “enemy combatants.” Additionally, the uniform remains the symbol for state power, and La historia’s careful language reveals Castro’s ambition to invade that symbol rather than destroy it. In a move familiar to readers of Marx’s 18th Brumaire of Louis Bonaparte, he seeks to retain the form, but substitute its content. In the defense, Castro seeks to achieve this peculiar political formalism, and rescue the uniform from the enemy, through a system of gory inscription. Referencing Batista’s March 10 coup, Castro marks his opposition in blood: “Desde ese momento el uniforme del Ejército está horriblemente salpicado de sangre” (34; emphasis added). The stained uniform, in this rhetorical gesture, serves as the marker to distinguish Castro’s Moncada fighters from Batista’s soldiers; and therefore the uniform sets the terms for the defense’s revolutionary ambitions—namely, to clean this stain: “Yo sé que algún día arderá en deseos de lavar la mancha terrible de vergüenza y de sangre que han lanzado sobre el uniforme militar las ambiciones de un grupito desalmado” (21; emphasis added). However, such cleansing cannot, in the logic of the defense, be equivalent to erasing the historical record; the military uniform, and the military institution cannot be condemned wholesale if Castro hopes to assume his place inside the uniform as the eventual head of state. It is for this reason that Castro finds the proverbial few good men in Batista’s army. From these exceptional cases, Fidel can partially rescue the uniform from Batista’s regime: “Si hombres como esos no hubiesen salvado en parte el honor de las Fuerzas Armadas, hoy sería más honroso llevar arriba un trapo de cocina que un uniforme” (69; emphasis added). Without “hombres como esos,” the few Cubans in uniform who refused to follow Batista, the uniform would be indelibly stained by Batista’s actions, and the blood of revolutionary martyrs would be worthless—so much salsa on a chef’s shirt. In order to rescue his own fighters’ honor Castro must prevent this costume change. Thus he goes on to hold out the possibility of recuperating the uniform as a garment still endowed with meaning and power. As he has been well aware of throughout his tenure as Cuba’s leader, the State’s authority lies not just beneath these clothes but on their very surface. Make the uniform a cook’s outfit, and Castro, “el jefe,” becomes a different kind of chef. In order to solidly secure the uniform for the revolution, Castro presents several horrific examples, emphasizing the difference between the revolutionary fighter and Batista’s soldiers by the directional difference between the two political bodies: in Castro’s examples the revolutionary soldier moves from the inside to the outside, spilling his blood out onto the world, whereas Batista’s fighter moves from the outside to the inside, staining himself with gore. The latter becomes a monster, Castro writes, who wouldn’t cease drinking from a river of blood until it was dry (Castro, 60). (4) Thus, the enemy uniforms end up marked by the spilled blood of the revolutionary martyrs, thereby allowing a distinction to be drawn between the two outfits. And with this distinction Castro can reclaim the military uniform’s historical and legal potency as a symbol for his own political ends. Given this emphasis on the uniformed body’s links to formal historical continuity, one other moment from the defense stands out. While Castro insists on marking the uniform to make it ready for his revolutionary body, he openly rejects the revolutionary potential of radio’s disembodied voice: “Yo pude haber ocupado, con solo 10 hombres, una estación de radio y haber lanzado al pueblo a la lucha” (Castro, 31). (5) And yet, “Se acordó no tomar ninguna estación de radio,” Castro writes, “y esta actitud nuestra…le ahorró a la ciudadanía un río de sangre” (Castro, 30). (6) In other words, the electronic terror established by the rhetorical link between radio and mass bloodshed is the effect of radio’s mass address, its ability to bypass bodies in uniform and access the pueblo at large. Power, Castro implies here, must be carried out by military bodies, sanctioned and controlled by military codes. Bodies continuous with military and national history. Bodies in uniform. Invoking (“Yo pude haber ocupado…) and then revoking the radio address, Castro seems afraid to call out the people from their homes. A people’s revolution, he seems to say, must not be carried out by the people. With this context in mind, I want to look back at the photograph of the apparently post-op Fidel. Our detour through history reveals something of the contrapuntal movement embedded within the photograph’s structure. In literally placing history (the word and concept) at its compositional center, the exterior photograph (Fidel holding the paper) insists that any viewer acknowledge its relation to the past. Temporal continuity seems at once forged and reconfigured as the familiar title of Castro’s earlier defense seems to echo through the exterior photograph’s contextual cues. No longer isolated and contained, the earlier text (La historia me absolverá) is conjured into dialogue with the exterior photograph’s temporality in order to assure the two photographs’ continuity, despite the costume change depicted in the movement between the two media (digital and print photography). At the same time, the exterior photograph derives its declarative power from its claim to inhabit a particular place in history. Its overt message—Fidel lives—depends on an assumption it requires its audience to share; namely, a certain analogical (non-digital) irreversibility of time (Stiegler, 152). Fidel was living, Fidel had surgery, and Fidel lives. However, the markers it employs to contextualize the scene everywhere call into question this one-way street of history. The newspaper headline informs us a break has occurred—a personal history, bound to a national and global history, has been fulfilled. The change occurs through a simple syntactic reversal: history will absolve me—absolved by history. 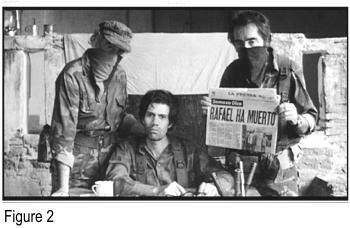 (7) Perhaps it is not insignificant that the subject has vanished in the newspaper headline, the deictic, “me,” substituted by the photograph of Fidel in uniform. For it is precisely this uniformed Fidel who has abdicated the exterior photograph. Traversing the textual history indexed by the headline, reading back through La historia me absolverá, the informed viewer is struck by this figure out of context, the uncanny appearance of this body outside of the uniform. It is an uncanniness (unheimlich) brought on by the un-uniformed body in the private context of the bedroom, the intimate space of feeling-at-home (Heimisch). And in this bizarrely choreographed encounter between public and private, the new uniform, the Adidas outfit in Cuban red, white, and blue carries with it the weight of multiple inscriptions. For if the entire defense focuses on the military uniform’s importance in establishing continuity with history in order to access and control state power, and the image archive of the past fifty years reinforces Fidel’s commitment to this idea, the Adidas track-suit seems to index a drastic break with history, a rupture in iconographic continuity, and even an implicit abdication of Fidel’s role as head of state. Even as its color scheme alludes to Cuba’s public relations face as an athletic and Olympic “power,” the outfit’s brand name brands the revolutionary sovereignty as yet one more style in the multinational corporation’s catalogue. In perhaps an unintentional clash, the exterior photograph no longer presents an unproblematic continuation of history, but rather the chaotic space of two histories on the verge of tearing away from each other. However paradoxical, it is precisely the photograph’s spectacular formal negotiation between these different temporal indices, between the historical photograph rendered in newsprint, and the digital photograph in which the former is embedded, which secures the corporeal continuity already implicit in La historia me absolverá. Such continuity out of discontinuity is possible due to the oscillating movement between the analog (interior/embedded photograph) and the digital or analogico-digital (exterior photograph). The latter term I borrow from Bernard Stiegler’s “The Discrete Image,” and it is his particular understanding of photography’s history that I will turn to now in order to shed some light on this encounter between technological and political history. Investigating the image produced by digital photography, Stiegler writes that “a technical development suspends or calls into question a situation which previously seemed stable” (Stiegler, 149). (8) Such suspension recalls the modal difference I argued was established between Fidel’s familiar photograph from Granma and the uncertainty and potential discontinuity induced by the digital image. In this case, the new media form of the digital image bids the audience to recognize the constructed aspect of the seemingly stable national history represented in the analog photograph in the newspaper. We are asked, in other words, to question the continuity between the different media and the political history they represent. In his most explicit formulation Stiegler writes that the digital’s novelty lies in discretization—decomposition, the night in which, analyzed, ‘that which was’ becomes discontinuous. Continuity is the condition of possibility of the Barthesian this was: we must have a sense of continuity, of the continuity, not simply of the chain of luminances, but of what is seen as well (Stiegler, 153). On the one hand is the Barthesian analog, the photograph that literally prints the image-object on photosensitive paper as this was, and passes that printed touch on to its viewers through a chain or “contiguity of luminances” (152). On the other hand rests the discrete and discontinuous analogico-digital image. The one connects, the other separates. Admittedly, all of this seems to fit too nicely with my analysis of Castro’s photograph. The analog photograph depicts the uniformed leader, the unified image sought in the legal defense, La historia me absolverá, which began his Revolutionary career. The digital photo unseats that homogenous authority, and introduces analysis and doubt into the seemingly solid chain. And only slightly veiled in this distinction is the separation of a public sphere, a Kantian sensus communis, what Stiegler identifies as a sense of continuity against a chaotic, dubious world of the night, the anti-Aufklarung of “discretization.”(9) Thus, Stiegler’s distinction between the Barthesian photograph and the analogico-digital might also be thought of as a distinction between public and private, the two contiguous spheres in this strange photograph of Fidel. Indeed, for Stiegler the digital vanquishes the private, if only because the digital photograph releases its claim to touch the individual (153). Authenticity is constructed, part of a process in which the sureness of Barthes’ “this was” yields to the banality of doubt, the absence of a sure touch, or what Barthes’ called the “punctum.” Without this affirmation, the “sentiment of an absolute irreversibility” vanishes as “digitization breaks the chain” (152-153). The public image, especially the increasingly transportable analogico-digital public image, forsakes the diachronic irreversibility of homogenous empty time, and jumping from screen to screen, from viewer to viewer, exchanges the fixing metaphor of the linked chain for the hyperlink. Of course, one might also understand these several chains and their actions as already implicit in the semiotic work performed around the Latin verb “absolvere” in the preceding analysis of Castro’s photograph. The word’s history and the identifiable differences in the photographic modes just mentioned should help refocus the viewer’s eye on this hybrid composition. While it remains true that the Spanish absolver references a type of loosening of the bonds or knots of history, it also carries the burden of religion, the ritual of last rites, and the absolution of one’s sins. This latter definition seems more appropriate given the photograph’s context: a fragile figure in leisurewear, seated at the foot of a tidy, white bed. Absolution here indicates a threshold moment, a reckoning with the past in preparation for a new mode of being. When Price shoots the photograph of the “living dead” the next morning, he links the snapshot to the long history of photography, converting the literal “camera oscura” into a photographic chamber, but he also reveals the dark means of photography’s ability to suture two distinct historical moments into one seamless continuity. Whether or not we follow Frederic Jameson’s interpretation of the film’s photograph as a “generalized ideological incapacity of North Americans to imagine collective processes” in favor of “the emotional securities of individualizing narrative paradigms” (Jameson, 40-41), the Cuban photograph’s imitation of Hollywood’s representation of Latin American revolution seems, slyly and strangely, to undermine the belief the post-op photograph is ostensibly meant to induce. The difference between the photographs—Fidel is alone and next to a bed, whereas Rafael sits in the war room surrounded by his guerrilla aids—only heightens the radical disjuncture between the apparent intimacy in the photograph of Fidel and the public discourse network in which it participates. Indeed, such “intimate publicity,” appears as the product of the photograph’s strange interpenetration of diverse media, and the temporal and ontological modes they index. (11) The peculiar lack of fit between the medium and the scene signals the uncanny sense I indicated above. We at once question why this intimate photograph has entered a public setting, and whether the body before us is what it claims to be. Even while it seduces its spectator with the intimate viewing of a public figure (a viewing most often reserved for State funerals) it repels belief, as the digital medium exaggerates the possibility for fabrication. As strange as it might seem, I am asking here if the digital, or analogico-digital photograph, this medium in which “the this was has become essentially doubtful when it is digital” (Stiegler, 153), if this photograph’s curious suspension between two worlds, public and private, and two histories, continuous and broken, might authorize the withdrawal of Castro’s body from the public sphere without yielding his power? If, in fact, the visual self-unity Castro has so carefully practiced throughout his public life, beginning with La historia me absolverá, has now allowed him to sustain a continuous presence while remaining publicly invisible, to retreat into a private world. The photograph, in other words, would inaugurate a move into the earlier disembodied media of print, a maneuver made possible by the digital alone. Thus, the photograph depicts Castro creating the “disembodied public subject” he will continue to identify under the signature Fidel Castro. Once the audience doubts its belief that Castro is dead, once doubt provides enough belief that Castro might be living, the analogico-digital photograph, the medium of doubtful belief par excellence, has accomplished its political purpose. In other words, the threshold created by this mixed media allows Castro to recede into the shadows of disembodied media, to be absorbed into the sporadic editorials of Granma. In this sense, Fidel benefits from the abstract, disembodied quality of media, while exploiting the public contract of the author function that ascribes texts to a name.12 Hiding his body (living or not), he publicizes his name, his printed signature apparently signifying a private living body. Diffused through these media channels, the state of Fidel’s body no longer matters. In this sense, the movement between analog and digital media systems seem to allow thought to go on without a body. With the caveat that the “thinking” that occurs is mainly the audience’s interpretive work to connect writing in a specific context to a particular body. (13) In identifying the analytic work that deconstructs apparent continuities as fundamental to the synthetic work of interpretation that galvanizes belief, and ties in or sutures the viewer/reader with the work, Stiegler comments that “this belief and incredulity are nothing other than the synthesis effected by the spectator [in English in the original], who intentionalizes the spectrum as having been” (157). As I stated above, doubt and uncertainty allow Castro to live and think, in the public’s mind, with or without a body. Media systems have achieved this temporary immortality for Fidel by threading their way back through the history of media in order for “new” media (the digital) to paradoxically make the earlier media of print believable as the carrier of an organic, individual brain’s thought. In doing so, they have surprisingly strengthened an individual’s privacy to the point that this public person can remain concealed from the public. Furthermore, they have successfully sutured a discontinuous moment in a personal and national history by explicitly revealing that discontinuity. They have allowed the figure of Fidel’s non-uniformed body to appear publicly, and through the recognition of discontinuity forged a chain to link the writings of the eventually invisible, post-op Fidel to the author of La historia me absolverá. They have, in a word, absolved him by linking him in a new way: “The chain of memorial light is not absolutely broken, it is rather knotted in a different way—otherwise, there wouldn’t even be a photograph anymore; we wouldn’t be able to speak of digital photography” (Stiegler, 154). 1. For a discussion of Lefort’s work in relation to Warner’s notion of counterpublics see Warner, 171-174. 4. In the exact words of the defense, Castro writes that Batista’s soldiers are “monstruos refrenados por la disciplina y el hábito social, porque si se les da a beber sangre en un río no cesarán hasta que lo hayan secado” (60). 5. In this connection between radio waves and spontaneous revolution he is not far from Hans Ezensberger’s provocative claim that “Revolutionary situations always bring with the discontinuous, spontaneous changes brought about by the masses in the existing aggregate of the media” (Ezensberger, 27; emphasis added). Castro’s anxiety about such “discontinuous” change brought about by the masses through the media will find a compelling echo and transformation in the carefully stage choreography of media in the digital photograph. It should be no surprise that his investment in historical continuity would lead him to reject the radio here, as it is radio, the ‘live’ medium, that Denis Hollier, borrowing a term from Derrida’s Archive Fever, names “anarchival” (Hollier, 19; emphasis in original). 6. The belief that the recorded sound can propel the masses to draw blood recalls Friedrich Kittler’s media chronology in which the radio derives from the phonograph, the medium from which Edison “found a way to transfer the functions of his ear to his sense of touch” (Kittler, 28), drawing blood with his voice as he touched the needle. 7. Absolver, from the Latin ab (out of) and solvere (to loosen), signifies detaching, or unhooking a moment from the historical chain in order to alter its syntax, thereby resignifying a past event with the perspective granted by a future moment. 8. Although Stiegler’s words here nearly echo Jay Bolter and Richard Grusin’s concept of “remediation,” the French theorist would disagree with the latter’s claim that “hypermedia and transparent media are opposite manifestations of the same desire: the desire to get past the limits of representation and achieve the real…The real is defined in terms of the viewer’s experience; it is that which would evoke an immediate (and therefore authentic) emotional response” (Bolter and Grusin, 53). Stiegler labors the point that such emotional authenticity, a key aspect to the phenomenological aspect in Roland Barthes’ Camera Lucida, reduces its capacity in its encounter with the skeptical mode induced by the analogico-digital. 9. From an opposing perspective Marshall McLuhan argued that the oncoming technological revolution would expand not threaten the community: “[McLuhan’s] famous claim that electricity was making possible an extension (and amputation) of the ‘sensory nervous system’ was really an argument for an extended version of the Aristotelian concept of a sensus communis, a coordinated (or deranged) ‘community’ of sensation in the individual, extrapolated as the condition for a globally extended social community, the ‘global village’” (Mitchell, 399-400). 10. See also MacBean, 4. 11. For more on this term see Lovoglio. 13. If the claim seems too outlandish here, consider Lyotard’s assertion that “Thought without a body is the prerequisite for thinking of the death of all bodies, solar or terrestrial, and of the death of thoughts that are inseparable from those bodies” (291). Thus, Lyotard’s thoughts on the solar disaster might be thought of in light of the terrestrial disaster of the individual death. Barthes, Roland. Camera Lucida. Trans. Richard Howard. New York: Hill and Wang, 1982. Print. Benjamin, Walter. “Theses on the Philosophy of History” trans. Harry Zohn. Illuminations ed. Hannah Arendt. New York: Schocken Books, 1968. Print. Bolter, Jay and Richard Grusin. Remediation. Cambridge: MIT Press, 2000. Castro, Fidel. La historia me absolverá. 1953. Buenos Aires: Editorial Quetzal, 1973. Print. Derrida, Jacques. Archive Fever. Trans. Eric Prenowitz. Chicago: University of Chicago Press, 1998. Print. Enzensberger, Hans Magnus. “Constituents of a theory of the media” in The New Media Reader. Edited by Noah Wardrip-Fruin and Nick Montfort. Cambridge: MIT Press, 2003. Print. Frohman, Clayton. Under Fire, directed by Roger Spottiswoode. Orion Pictures, 1983; Century City, MGM, 2001. DVD. Foucault, Michel. “What Is An Author?” The Foucault Reader ed. Paul Rabinow. New York: Pantheon, 1984. Print. Hansen, Mark. New Philosophy for New Media. Cambridge: MIT Press, 2004. Print. Hollier, Denis. “The Death of Paper: A Radio Play.” October, Vol. 78. Autumn (1996): 3-20. Print. Jameson, Fredric. The Geopolitical Aesthetic: Cinema and Space in the World System. Bloomington: Indiana University Press, 1992. Print. Kittler, Friedrich. Gramophone, Film, Typewriter. Trans. Geoffrey Winthrop-Young and Michael Wutz. Stanford: Stanford University Press, 1999. Print. Lefort, Claude. “The Image of the Body in Totalitarianism.” The Political Forms of Modern Society: Bureaucracy, Democracy, and Totalitarianism, ed. John B.
Thompson. Cambridge, MA: MIT Press, 1986. Pg. 306. Print. Lovoglio, Jason. Radio’s Intimate Public. Minneapolis: University of Minnesota Press, 2005. Print. Lyotard, Jean-François. “Can Thought Go On Without A Body?” The Inhuman: Reflections On Time. Trans. G Bennington and R. Bowlby. Stanford: Stanford University Press, 1991. Pgs. 8-23. Print. Dangerously.’” Film Quarterly. Vol. 37. No. 3. Spring, 1984: 1-13. Print. Marx, Karl. The Eighteenth Brumaire of Louis Bonaparte. New York: International Publishers, 1963. Print. Mitchell, WJT. “There Are No Visual Media.” The Journal of Visual Culture. Vol. 4, No. 2. (2005): 257-266. Print. Stewart, Garrett. Between Film And Screen: Modernism’s Photo Synthesis. Chicago: University of Chicago Press, 1999. Print. Stiegler, Bernard. “The Discrete Image” in Echographies of Television. Trans. Jennifer Bajorek. Cambridge: Polity Press, 2002. Print. Warner, Michael. Publics and Counterpublics. New York: Zone Books, 2002. Print.